Earlier this year, the sUAS space took a much-awaited leap in the right direction when the FAA released a draft of proposed rules for commercial small UAVs. The rules, fashioned after the agency’s risk-averse approach to drones, were, for the most part, received positively by industry stakeholders. Among the elements, many were quick to point out the requirement to maintain visual line of sight. As a company who has devoted thousands of research hours to develop tools that allow flights beyond VLOS with a compelling degree of confidence, we still see these proposed rules as an enabler instead of deterrent. 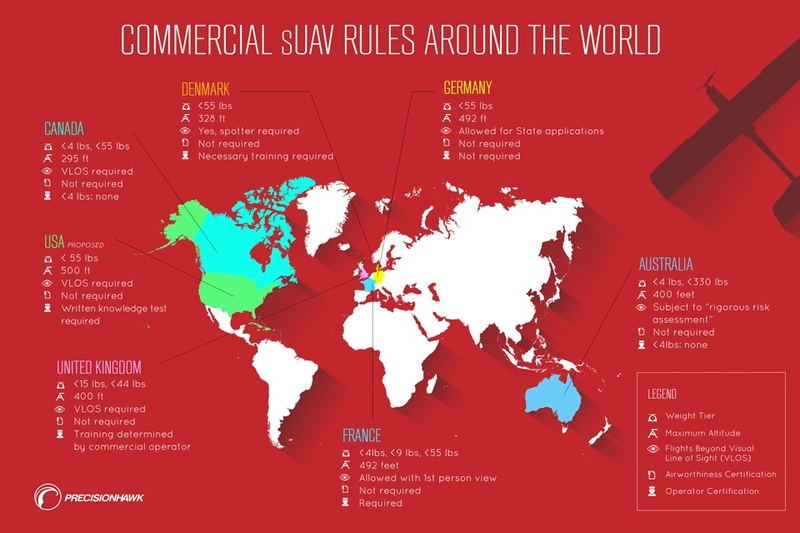 To offer some perspective, we put together a graphic detailing current commercial sUAV rules around the world - specifically in countries where commercial UAS markets are strong and flourishing. The above information was gathered through our partnership with the Small UAV Coalition. For more details on each country’s drone rule, kindly refer to their corresponding websites. Analysts claim that it will take another two years for the proposed rules to be finalized. In the interim, we encourage the public to be actively involved in shaping a highly competent set of rules that will not only address pressing concerns but will also celebrate innovation and pay tribute to the work of our best and brightest visionaries.